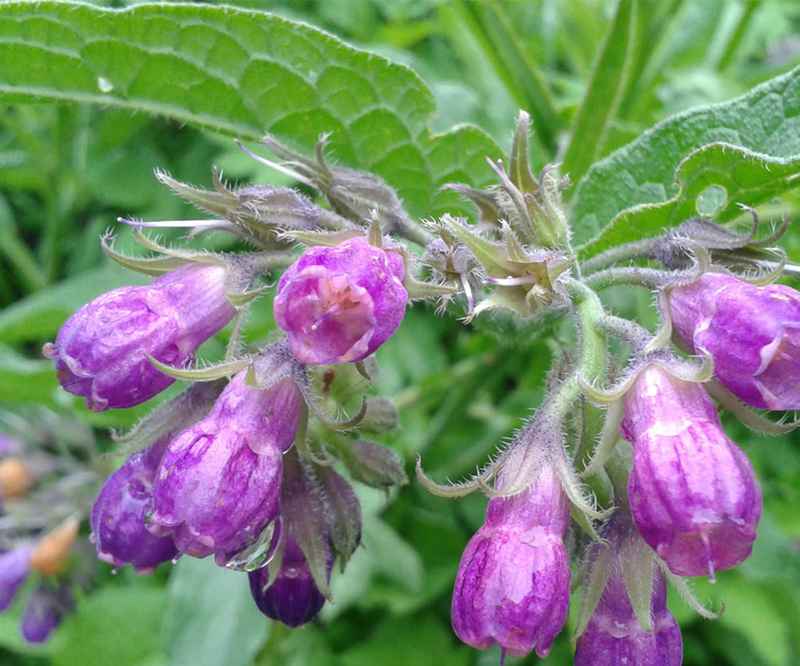 Comfrey has an oblong, fleshy, perennial root, black on the outside and whitish within, containing a glutinous or clammy, tasteless juice, with divers very large, hairy, green leaves lying on the ground, so hairy, or so prickly, that if they touch any tender parts of the hands, face, or body, it will cause it to itch. The stalks are hollowed and cornered, very hairy, having leaves that grow below, but less and less up to the top; at the joints of the stalk it is divided into many branches, at the ends of which stand many flowers, in order one above another, which are somewhat long and hollow like the finger of a glove, of a pale, whitish color; after them come small black seeds. There is another sort which bears flowers of a pale purple color, having similar medicinal properties.